Enjoy Flash sale from Metro Canada. 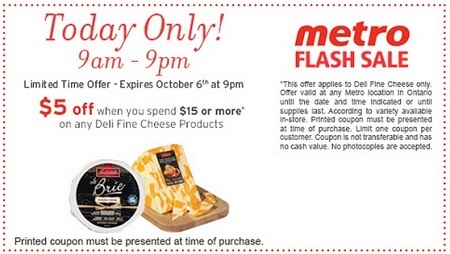 Spend $15 or more on any Deli Fine Cheese products and save $5 on your entire purchase at any metro store in Ontario. The offer is valid on Tuesday, October 6, 2015 from 9:00 am to 9:00 pm only. The coupon must be printed to receive the offer. Official source of the information is Metro Canada.